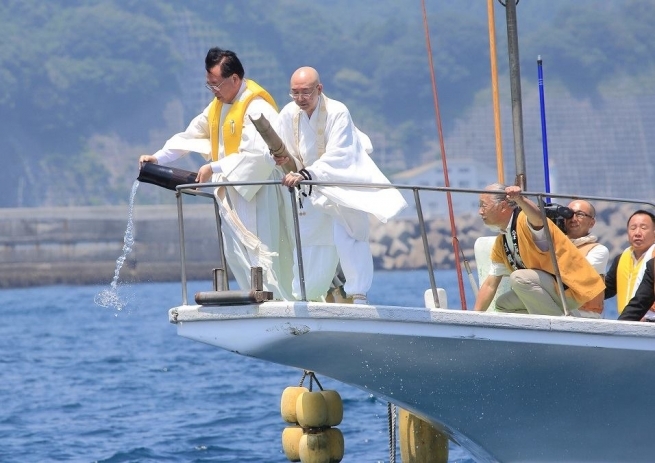 (ANS - Iwaki) - Last Wednesday, July 12, the sixth interreligious prayer meeting was held on the coast of the Fukushima Prelature in Ena Harbor, Iwaki, to commemorate the victims of the 2011 earthquake and tsunami in eastern Japan. The meeting, attended by more than 250 people, was coordinated by reverend Eikan Tsutsui, the Buddhist monk of the Yakushiji Temple, while the logistics were borne by the Iwaki Risshokosekai lay Buddhist group. Among the guests: Salesian Fr Mario Yamanouchi, SDB, Superior of the Salesian Province of Japan, together with the Sisters of Charity of Jesus, and the Sisters of the Congregation of Notre Dame, the only religious presence in the city of Fukushima - with a kindergarten, primary and secondary school. The initial greeting was made by Fr Yamanouchi after a first invitation to prayer by Reverend Eikan. The monk of the Yakushiji Temple - the main temple of the Hossō sect, the oldest Buddhist sect of Japan – then prayed in front of a fire, followed by representatives of the various religious groups present - Catholics, a monk of the local Buddhist temple and members of the Risshokosekai. Subsequently, two small boats departed from the port, each with about 15 passengers aboard who set sail on the ocean; once they reached a distance and were barely visible on the horizon, on another boat Fr Yamanouchi and the reverend Eikan poured blessed water and saké (a typical Japanese fermented rice-based alcoholic beverage) into the ocean, while all those who were with on the boat with them began to disperse sheets of precious washi paper with the names of all the earthquake and tsunami victims transcribed on the paper into the ocean. Those who remained in the harbor also prayed and performed similar rituals guided by a monk and disciple of Reverend Eikan. A delegation from the local government and the police also attended the celebration, which lasted almost two hours. About three-quarters of the participants belonged to the Risshokosekai of Iwaki, but other faithful from the areas near Ena port also participated. In an atmosphere of heartfelt emotion, the commemorative ceremony ended with the song of reconstruction of North-East Japan entitled "Hana wa saku", or the plant that was sown will flourish.